There is absolutely no doubt that every android smartphone comes preloaded with a file manager, however when you take a close glimpse at your smartphone default file manager, you do agree with me that there’s no much functionality added to it. From experience the only thing your default file manger is capable of doing well is to move or copy file from one folder to another. Don’t get me wrong here!…extracting zip or rar file with your default file manager can never be easy and dangerously time wasting if you don’t have a third party file manager installed on your android smartphone. The quality of a pretty file manager is not only reviewed on it’s capability to move, extract and copy files. There is much more to this…getting a file manager can be quiet way easy but finding a pretty file manager bombarded with lot’s of essential features can never be easy. This is were Es File Explorer merges in, back when android was still tweaking it’s UI for better functionality and classic look, es file explorer has always been there for us all. Out of all the file managers for android ever developed, I can boldly proclaim Es File Explorer to be the best among them. Don’t disagree with me on this one because I have also had a taste on other file manager and from the result even after using them, I still navigate back to Es File Explorer. Also Read: Parallel Space Review: Best Android App To Clone & Run Multi Account Of Same App & Games. Es File Explorer is not only a file manager, as it has proved to also be a download manager and most importantly it’s also a cleaner app. This are some of the bombarded rich features i have been proclaiming. A file manager with lots of deep essential features can never be underestimated nor ignored. If you’re new to android ecosystem and you’re still searching or wondering which file manager you can use to boost up your device functionality then there’s absolutely no need to keep searching as we’re recommending Es File Explorer to you. Reason been detailed below!. Es File Explorer is considered as the most powerful file manager for android phones and it’s been updated frequently with tons of essential features to improve it’s functionality. Its certainly no surprise that there’s more to do with Es File Explorer if you adapt to it’s UI but let’s have a close glimpse at some of it’s outstanding key features. Es file explorer has the best file management tools that’s quiet bewildering. With these tools you can easily copy, share, move, encrypt, rename, compress, view file properties and decompress your files with ease. One of the best functionality it came with is that it has the capability to automatically move deleted files recycle bin. These is certainly the best feature i personally fancy in Es File Explorer and it comes in handy if perhaps you mistakenly deleted a file or folder. Es File Explorer also unveils some amazing file management tools as you can easily Chromecast your files and also add them to desktop in other to create app shortcut. The hide option can never be neglected either as you can easily hide files and view them from the hide list. Also it features a root explorer which comes in handy for rooted android users as you can easily tinker with your system files once enabled. Es File Explorer isn’t lacking either when it comes to multimedia options. As this features can be seen fully hidden under the library folder. From the library folder you can access your images in album view styles, also you can choose your favorite music and play it within the library. Not to mention, es file explorer can also be referred to as a movie player as you can easily access your favorite movies from movie option and then play them within the app. If we’re to explore more on the library options, you can see the document option that gives access to all the document files on your android phone with one easy click to view the file and then read them. The app option gathers all the applications on your smartphone and shows it in a bigger style. Thus you can easily install them or delete them from there. The multimedia explorer proves to come in great handy when you feel like accessing your multimedia files right from es file explorer. Es File Explorer certainly brings an essential feature with it. The cloud storage integrated in this file manager app can easily let you switch between your local storage files and cloud storage file with ease. Thus you can easily have access to all your cloud files within Es File Explorer. Also you can easily move your files between the local and cloud storage found in Es File Explorer. From the cloud storage integrated in Es File Explorer, you can easily add a new server by tapping on the plus sign that can be seen at the upper right corner of the app. There’s support for cloud storage services like Box, SugarSync, DropBox, OneDrive, GoogleDrive, S3, Yandex, MegaCloud, Baidu NetDisk and MediaFire. Also more servers might be integrated in nearest future once the update starts rolling. If you’ve ever craved for a file manager with a file transfer capability, then Es File Explorer is certainly what you might be looking out for. It allows you to easily transfer files such as videos, images, music, document etc. over a WiFi connection thus you don’t have to worry about sharing files with your mobile data connection. With the file transfer feature integrated in Es File Explorer, you can easily transfer files to another android smartphone or even to a computer system. Not only that you can also send files to your recipients through Bluetooth paired devices. Es File Explorer as allows you to share network connection and the good news is that there’s no limitations on file sizer or type. Thus you can transfer huge amount of files to your recipient with ease. Es File Explorer does a good job by analyzing your storages usage and informs you of junk files, duplicate files, redundant files, recently created files, large files etc. With this feature, user’s can easily clean up unwanted files from their storage and thus free up space and helps to speed up device. Also not to mention, Es File Explorer let’s you to create a custom gesture for various applications installed on your device. Thus you can create a gesture to open an app, folder, files, Windows etc. Or rather you can use a custom gesture to exit a window. Once a gesture is created, there’s an option to delete or edit it to your preference. The gesture feature isn’t bad either. Es File Manager is not only referred to as a file manager, it’s a powerful web browser that gives you access to explore the internet. From the web browser options, you can easily navigate to the Google playstore, read addictive news from Google news site and access weather information. There’s also an option to access movies from youtube, browser some Google images, download and play music from the google play, navigate to Facebook, browse applications and much more. Also you can create a custom address to access if you choose too. Now that you’ve seen some of the highlighted features integrated in Es File Explorer, it certainly won’t be a bad thing if we go deep to look at the user interface. As I emphasised earlier, Es File Explorer is been updated frequently to improve it’s functionality and at the process a brand new UI is been integrated into the file manager. The app has an intuitive UI and it’s a top notch if only you can master it. From the homepage Es File Explorer opens various categories of different types such as images, music, movies, documents, app and cleaner. From the left edge (swipe the screen from the left) of Es File Explorer you can see some of the options fully integrated in it. Some of the options can be overwhelming, however once you check out there designated functions individually then navigating through Es File Explorer can be very easy. If you scroll a little bit below the left edge, there’s a theme option that allows you to change the folder style, text color, background colors etc. 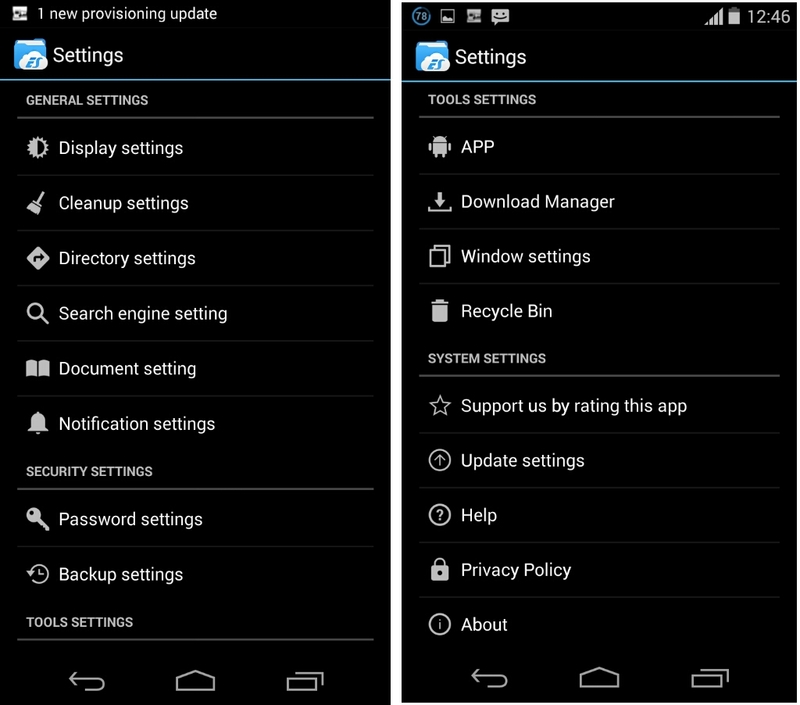 The right edge of Es File Explorer once swiped unveils the clipboard and an option to navigate through the windows. Also there are lot’s of customization you can do while using Es File Explorer. From the settings you can tinker with the display by ticking the boxes. The backup settings on tapped on reveals an option to set backup direction. You can also set the default window choose to password your files from unauthorized users. There is more to tinker in the settings tab, so you’ve to explore the options individually and see there numerous functions. With the plethora of rich features Es File Explorer brings, there’s certainly a need for you to use this file manager. 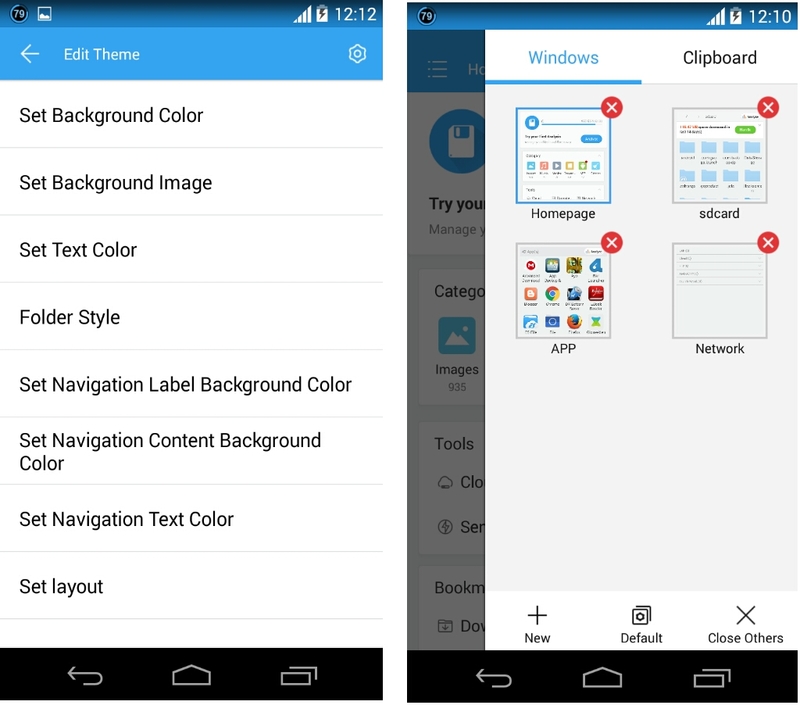 It makes an exception from others and stands boldly on its own making it arguably the best file manager for android. However Es File Explorer can be upgraded to the Pro Version to enhance it’s potentials. So this is the reason why we’ve reviewed and recommended Es File Explorer to you. Forget your default file manager and use Es File Explorer to enhance your android smartphone.